A controversial subject in home brewing is whether to treat your sparge water the same as you do your mash water when home brewing beer? This week we look at several competing camps and try to answer this difficult question for home brewers. Treating your brewing water may include adding salts (Epsom salt, baking soda, gypsum, etc…) as well as acids (usually lactic acid, acid malt or phosphoric acid). Salts are usually added to achieve a desired water profile for the beer, while acids are commonly added to bring the mash pH down to an ideal range of 5.1-5.4 for mashing. There are several competing factors in treating mash and sparge water. As mentioned above water salts are typically added to achieve a desired water profile which can be done to lower the residual alkalinity of the water, control the chloride to sulfate ratio (which drives bitterness), match a profile for a given city or beer style or perhaps just to place the six major water ions within the acceptable range for brewing and a healthy fermentation. Common additives include gypsum, epsom salt, table salt, calcium chloride and baking soda. In many cases the addition of salts alone is not sufficient to achieve a low enough mash pH. In these cases you should measure your pH and add an acid if it is not low enough. Typically lactic acid, phosphoric acid and acid malts are used at the homebrew level to control the mash pH for optimal mashing. Finally, during the sparge you need to avoid allowing the mash pH to rise too high (called “oversparging”). In particular, pH levels above 5.8-6.0 can result in excessive tannin extraction from the grains leaving an astringent flavor in the finished beer. In practice oversparging is pretty rare in home brewing as home brewing equipment is not as efficient as commercial brewing equipment and also we rarely sparge to the point of maximum extraction. I Don’t Treat No Stinking Sparge Water! – There is one group of brewers that simply don’t add any water treatment at all to their sparge water. Some of the reasons include a belief that salts won’t have enough time to work, the fact that oversparging is very rare in home brewing, and finally a belief that adding more acid could result in off flavors. Phosphoric and lactic acids have their own flavor if used in high enough quantity. These people also point out that pH is most critical during the mash itself, and absent the rare event of “oversparging”, adding more stuff to your sparge water may just be solving a problem that does not exist. Just treat your mash water and its good enough! Add Salts but Don’t Add Acids – The middle group of brewers do add water salts to their mash and sparge water but don’t bother with adding acid to control the pH. Like the previous group they believe that oversparging is unlikely and the acid is not really needed. However, they do support adding salts to match the overall water profile for the beer. This is important if you want to be sure of your final water profile and have the correct range of the six major ions in the finished beer. Add Acids but No Salts – Another middle group treats their sparge water only for pH using acid additions, but does not bother with salt additions. Their rationale is that managing the pH during the sparge is important to avoid oversparging, but not that important for maintaining the overall water profile. Some of these people that do use salt additions will just add all of their salts to the mash water, arguing that it will all work out in the end. Treat Both Sparge and Mash Water – The final group treats the mash and sparge water the same – adding proportionally the same amount of salts and acid to the sparge as they used in the original mash water. This way all of the water has the proper ion content for brewing and all of the water is treated for the proper pH to avoid oversparging. So which camp is right on sparge water? Well to tell the truth, oversparging is a fairly rare phenomenon in home brewing, but it can happen particularly if you are not measuring and adjusting your pH during the mash. However if you are measuring and controlling your mash pH, the chances of oversparging are very small for typical beers. On the other hand, if you are adding acids proportionally to both your mash and sparge water, you are effectively lowering the pH of both. This means you will further lower the chance of oversparging. Salt additions to get a proper ion range do play a role in the mash chemistry, so I would recommend at a minimum adding salts to achieve your desired water profile to the mash. Salts play a smaller role in sparging, but on the other hand there is usually little downside to adding salts to both the sparge and mash water, so I will typically treat both the sparge and mash water the same (i.e. add salts in proportion to the volumes). This avoids too much salt in the mash itself, and also assures me of achieving my final water profile. So I guess if I have to choose sides, I fall into the last camp – I treat my mash and sparge water the same, adding both salts and acid in proportion to the volume for each. This assures that I’ll get the water profile I want and also significantly reduces the chance of oversparging. If you have some thoughts on the subject – leave a comment below! Thanks for joining me on the BeerSmith Home Brewing Blog. Be sure to sign up for my newsletter or my podcast for more great tips on homebrewing. 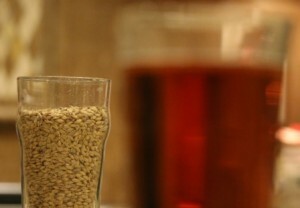 Also check out the How to Brew Video series I shot with John Palmer if you want to learn more about all grain brewing. Interesting read. How would this change if using Chalk in the Mash? As I understand it, Chalk is only effective if added directly to the Mash, so it wouldn’t effect the Sparge water as desired. Is this correct? Maybe you can help put me straight? I am looking to use Salts for the first time. I want to brew a Foreign Extra Stout. My question is… Will using Chalk in the Mash help me to achieve the desired Calcium & HCO levels without raising the Sodium, Chloride & Sulfate levels too much, as using Sodium Bicarbonate & Gypsum seems to.